What do I do if my closing balances from last year are not the same as my opening balances for the current year? Re-calculate Opening Balances - this function is used if you have made changes to your previous year cashbook data file and now wish to update any opening balance figures that may have been affected. 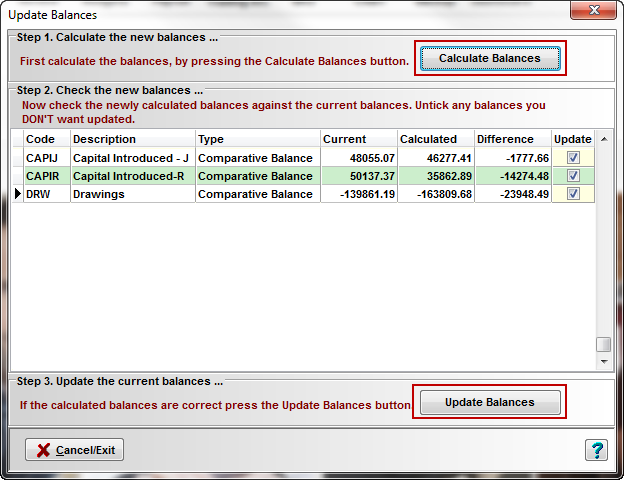 Click on the Setup > Opening Balances > Re-calculate balances from last years data menu option. Click OK to Information message: 'Transaction Check Complete' or Click OK to view the results. Differences will be displayed in a list - ensure that those you wish to update are ticked (un-tick any that you don't wish to update). Check the new balances. Click the Update Balances button.